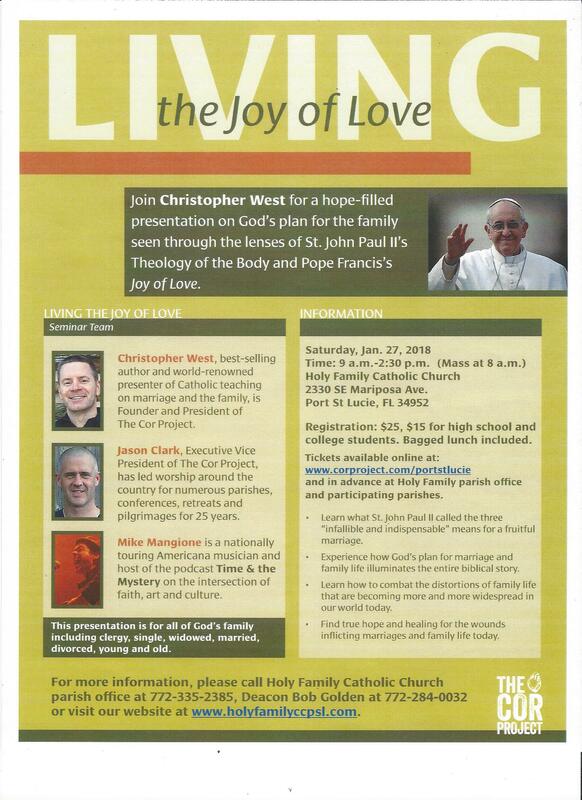 For your convenience, you can now purchase tickets ONLINE to Holy Family's Event "Living the Joy of Love" with Christopher West~~ see you there! There are 5 ways to register for this event! 1- Come in to Holy Family Parish Office, open Monday-Friday, 9-5, and pay with cash or a check. 2. Go in to a participating parish office-- call your parish office to see if it is one! 3. Click this link to Eventbrite and purchase your tickets online with a credit card. 4. Purchase your ticket with cash or check before or after all weekend Masses at Holy Family during the month of January. Upon receipt of payment, your ticket will be mailed to you.